Today you’re hearing from one of our partners, Laura Francoeur, chief wildlife biologist for the Port Authority of New York and New Jersey. Photo courtesy of Laura. 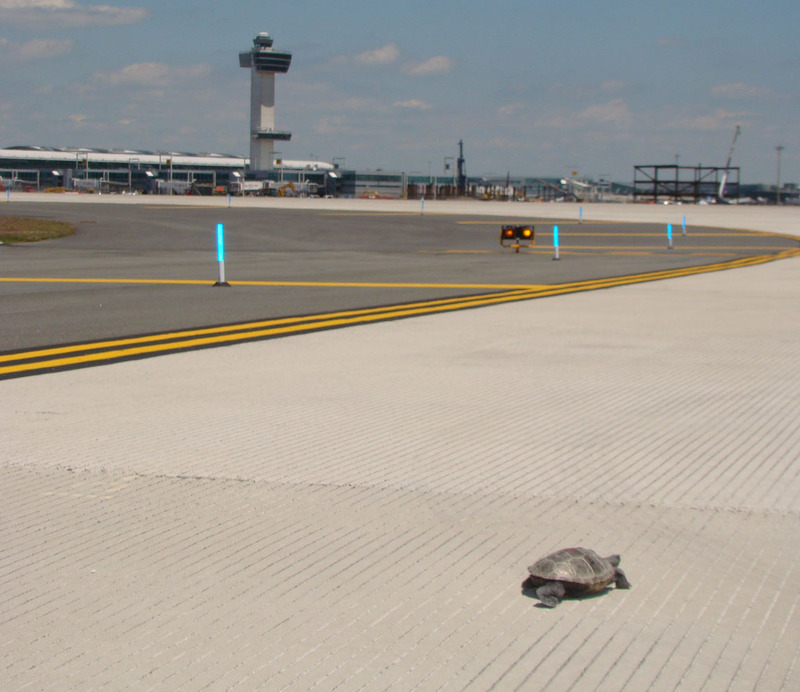 It was the summer of 2011, and we had 20 female diamondback terrapins (Malaclemys terrapin) crawling across the taxiways and runway at John F. Kennedy International Airport in Queens, N.Y.
Airport operations staff scrambled to pick them all up. Aircraft pilots discussed the terrapins on the radio with the air traffic control tower. And just when we would try to reopen the runway, another terrapin would be spotted. The 10-15 minutes felt like hours. Sure, it was a serious issue, but watching the terrapins cross oblivious to the vehicles and aircraft was also amusing. This annual terrapin rite occurs at JFK every June and July, when female terrapins come out of Jamaica Bay looking for nest sites above the high tide line in sandy or loose soil. While no one knows exactly how long the terrapins have nested in Jamaica Bay, we do know that it has been happening since the late 19th and early 20th century, when turtle soup was a popular dish at many local New York City restaurants. Years ago, we only observed small numbers of terrapins at JFK. If we spotted terrapins, we picked them up and carried them to the other side of the road. Following an extremely rainy spring in 2009, we observed hundreds of terrapins at JFK. On peak days, there were almost 200 terrapins nesting during a 1-hour period. Aircraft traffic also peaks during the summer months, which led to a couple of brief delays while airport operations staff moved terrapins off the runway. Those delays can create a ripple effect, causing aircraft traffic delays at airports across the country and the world, so the airport soon contacted local terrapin experts for information on the strange phenomenon. 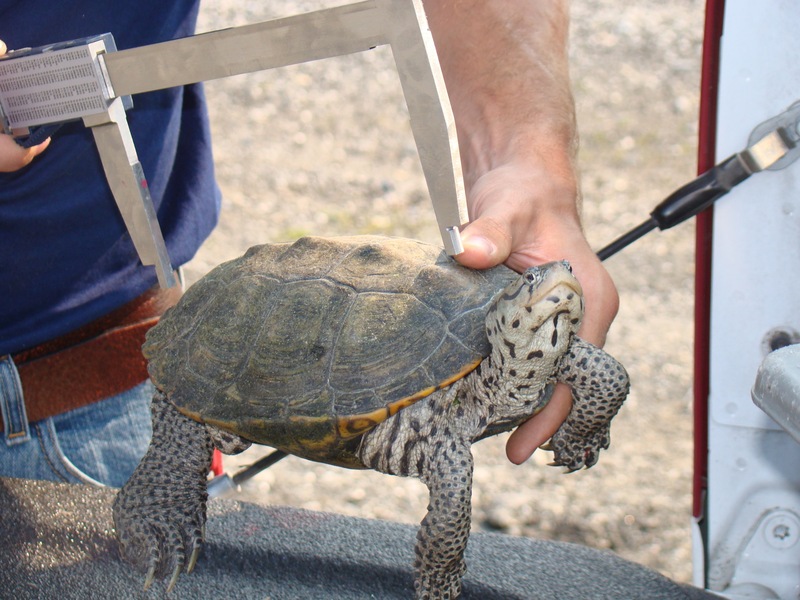 Starting in 2010, staff at JFK picked up all terrapins and collected data on the size and age, marked them, and then released them. We inserted a scannable microchip (PIT tag) into each terrapin that is similar to what veterinarians use to identify lost cats and dogs. We then monitored individual terrapins and shared data with the wildlife biologists working across from the airport at the Jamaica Bay Wildlife Refuge, managed by the National Park Service. So far, the data shows that the terrapins nest on similar dates within Jamaica Bay; however, there are a lot more terrapins nesting at the airport, and they appear to be younger than those at the wildlife refuge. 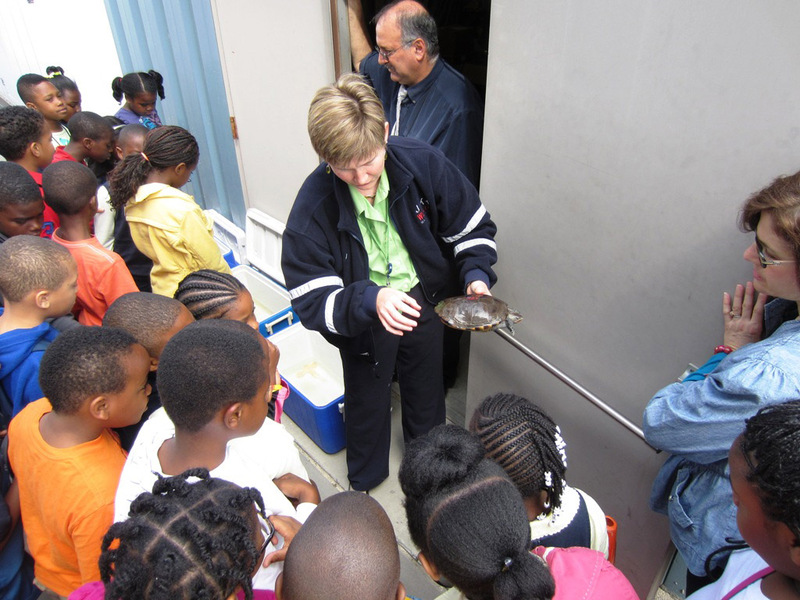 Laura talks about the terrapins at John F. Kennedy International Airport. Photo courtesy of Laura. 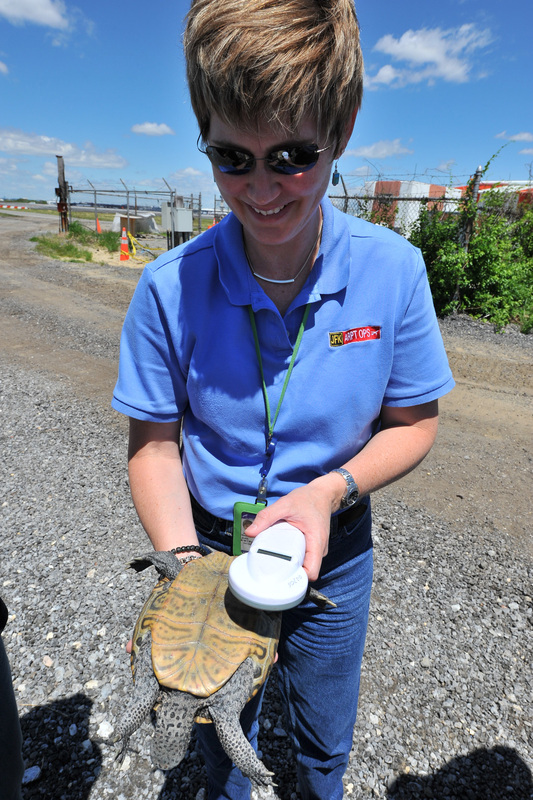 In 2012, JFK airport staff collected, marked and released more than 1,300 terrapins during a 6-week period. There’s been a lot of community interest in the terrapins, too. In fact, if I went to the grocery store after work with my airport coat on or my badge still around my neck, people would stop me to say that they’d heard about the terrapins at the airport and want to know more about it. 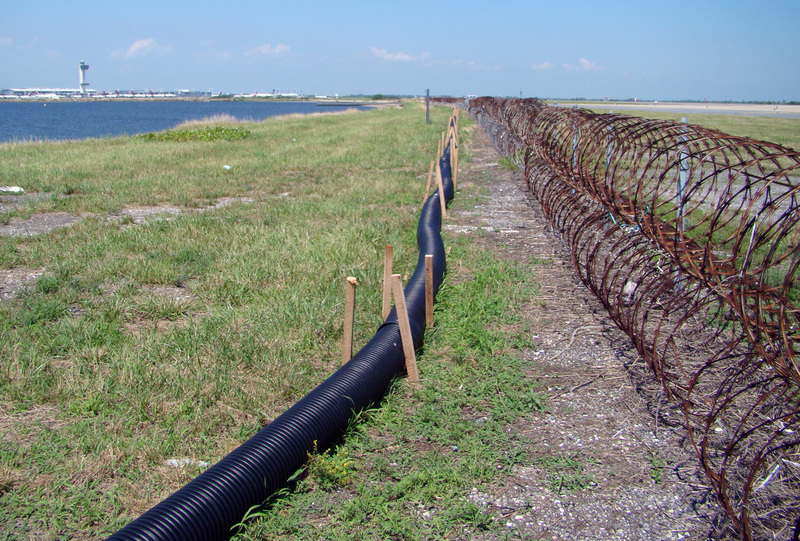 To reduce the terrapins’ impact on aircraft traffic, the airport set up two types of test barriers to try to deter the terrapins from one of the runways most impacted by nesting activity. Those tests showed that terrapins were not able to climb over the barriers and some terrapins navigated around the barriers while others simply found available nesting sites adjacent to the barriers. This led to a permanent barrier installation in 2013. While the barriers are not yet completely installed, there is ample nesting habitat for the terrapins outside the barriers, and the barriers prevent them from having to cross taxiways and runways and risk being struck by a vehicle or aircraft. The JFK airport wildlife biologists will monitor the terrapin activity in 2014 to see how effective the barrier is and if the terrapins choose to nest in available habitat outside the barrier or shift to new locations on the airport. While I never thought I would be working with nesting turtles at JFK, it’s been a nice break from our typical bird issues, and I’ve met some great herpetologists with whom I may never have crossed paths. This entry was posted in Blog entries and tagged diamondback terrapin, herpetology, herps, jamaica bay, JFK airport, john f. kennedy international airport, National Park Service, port authority, port authority of ny & nj, turtle conservation, turtle crossing, usfws, wildlife conservation on August 30, 2013 by usfwsnortheastblog. Hi Molly! Thanks for your comment. Glad you like the story! The writer is Laura Francoeur, chief wildlife biologist for the Port Authority of New York and New Jersey. This is noted with her photo on the right at the top of the story. Great story and liked the pictures of the terrapins. I really really enjoyed this story. Thanks. I am fascinated that the Port Authority has a chief wildlife biologist. I look forward to hearing more from her and I’m going to subscribe via email. What interesting and important work this was for both the terrapins and the airport. Thank you, Alison! We hope to have Laura guest blog for us again soon!